Recently I came across many editorials with floral graphics and collage elements, such as Karlie Kloss & Aline Weber for Free People’s July 2012 Catalogue and Eszter Boldov For Dossier Journal Online, and I felt inspired to create my own! I did, however, keep it minimal to make sure it does not overpower the delicate details of my dress. I absolutely adore the embroidered eyelet overlay, it reminds me of Louis Vuitton Spring 2012 RTW... one of my favorite collection of Spring 2012. Lastly, what's better to go with this delicate piece than a pair of feminine yet edgy studded flats? 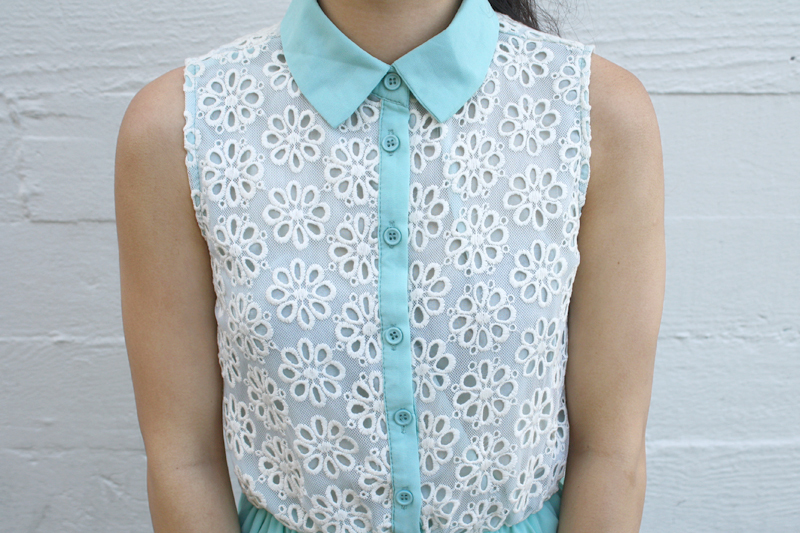 Embroidered eyelet chiffon fishtail dress from Sheinside. Thrifted vintage basket woven handbag. Strappy studded flats from Romwe. My dress matches my mint cat iphone case! Follow me on instagram @itsnotheritsme. If you want you can follow me too! this outfit makes me want to go on a picnic. and i love that basket purse! omg i love that dress! I love the two pastels together. That dress is absolutely gorgeous. I love that lace! And your floral background stuff looks very cool. oh my gosh this is such a lovely dress! oh my goodness, that cat case ... it's so cute!!!!! I just came across your blog and I pretty much am in love with all of your shoes... !